Substitute Nick Cowburn scored a late equaliser as Newcastle Jets held A-League leaders Sydney FC to a 1-1 draw on Saturday. The struggling Jets - bottom of the table ahead of this clash - looked set to come up short against the 2017-18 premiers after Alex Brosque's scrappy first-half effort, only for Cowburn to net three minutes from time. 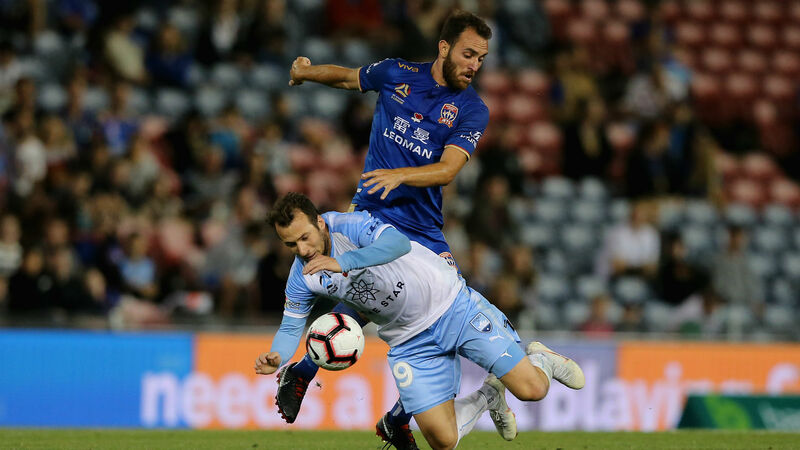 Adam Le Fondre's scoring streak ended at six games in all competitions and Sydney were instead grateful for some generous goalkeeping as they opened the scoring. Rhyan Grant delivered from the right and Brosque, getting across his man, headed goalwards, the ball squirming under a despairing Glen Moss. However, Newcastle grew into the contest and ended well on top, seeing a Ronald Vargas penalty appeal turned down before Cowburn directed Dimitri Petratos' free-kick inside the near post. Elsewhere, Brisbane Roar battled back from two behind to claim a 2-2 draw at Western Sydney Wanderers. Brisbane - winless this season - trailed to an early Oriol Riera double, but Alex Lopez's strike late in the first half brought the visitors back into the contest. And when Eric Bautheac was felled in the area shortly after the break, Adam Taggart netted from the penalty spot to earn a share of the spoils.